There was another meeting related to Junction Hollow / Panther Hollow / Four Mile Run stormwater yesterday. This affects the Junction Hollow Trail. 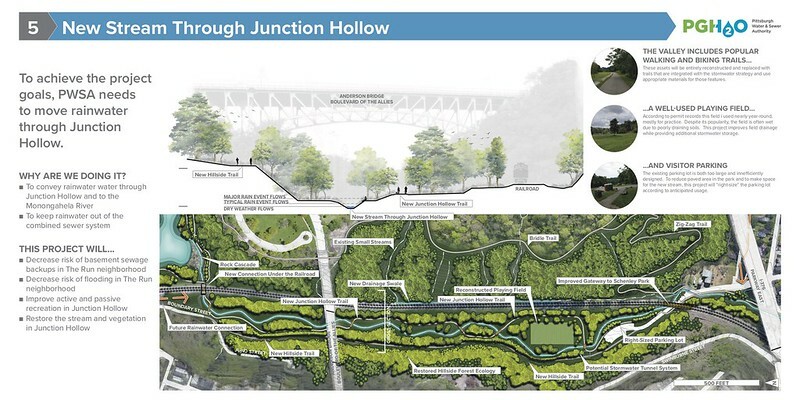 Daylight (bring out of the culvert) Junction Hollow Run for all of its length, and Four Mile Run until it gets close to Greenfield Ave.
Do major landscaping around Panther Hollow Lake to deepen it, in Junction Hollow create flood plains to buffer water during flood events. The soccer field would be one. Hillsides full of japanese knotweed would get replanted. Panther Hollow Lake would drain through a tunnel under the CSX railroad tracks that would accommodate both trail and water flow. Yay! Expect occasional trail flooding here. Create a meandering bike/ped path through Junction Hollow that crosses Junction Hollow Run several times. The levees and bridges on which this trail runs would act as partial dams to slow water flow. Expect less flooding in the Four Mile Run neighborhood. Create an additional bike/ped path on the west hillside of Junction Hollow that doesn’t meander. This would be the fast bike route. They mostly avoided discussing it (“that’s DOMI”) but this hillside trail might also support the shuttle between Hazelwood Green and Oakland. If the shuttle happens, the trail would be a protected bike lane on the road. They plan to keep a trail open during construction. No plans related to The Chute. That’s DOMI, not PWSA. Major construction late 2019 – late 2020. There’s other planned construction on residential streets upstream of these runs (redirection of home downspouts out of the combined sewer pipes into bioswales) that might be completed 10-20 years from now. Generally looks like an improvement to me, so long as the Hillside Path is asphalt rather than crushed stone. Does this imply any improvement of Zigzag & Bridle Trails? 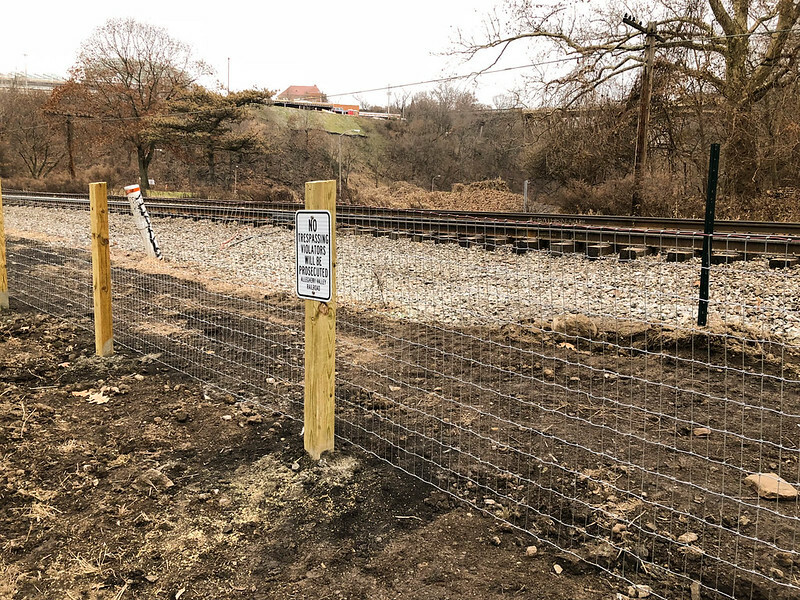 Those could be a timesaver for travel between the EFT trailhead and Squirrel Hill South. Tho alternately the route past PH Lake could also suffice, if paved. Here are two of the posters from Wednesday’s meeting. See that 4mr.org link for the others. Attendees were requesting improvements to the Zigzag trail (e.g. easier grade). One of their posters said something about improved drainage on Bridle trail. They didn’t discuss trail surfaces in any detail. Zigzag trail or something like it would really be needed in advance of PWSA’s breaking ground, to ensure there’s a detour in place for the Junction Hollow trail, which will be completely unusable for at least a year after construction begins. In any case, it would be a great amenity to have a traffic-free bike-friendly route connecting the bottom of the hollow to the top of Oakland/Squirrel Hill/Greenfield. Advocates needed to make sure DOMI doesn’t omit to provide this detour. trib article about the official unveiling of the plan. not really any new info. 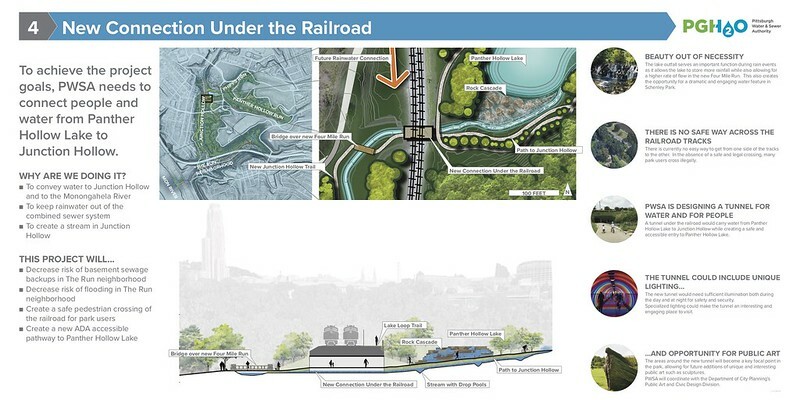 The Pittsburgh Water and Sewer Authority has committed $40 million to the project as part of its federally required stormwater management plan, according to spokesman Will Pickering. Peduto has set aside a total of $23 million in 2019 and 2020, according to the city’s 2019 capital budget. Does anyone know the cost breakdown here? How much is the GI project and how much is the shuttle road? I don’t know in detail but I bet that the budgeted money doesn’t include shuttle, since the shuttle design is still up in the air. Does Hazelwood Green have any future tenants yet? Is anything being built there currently or is it all in the planning stages? 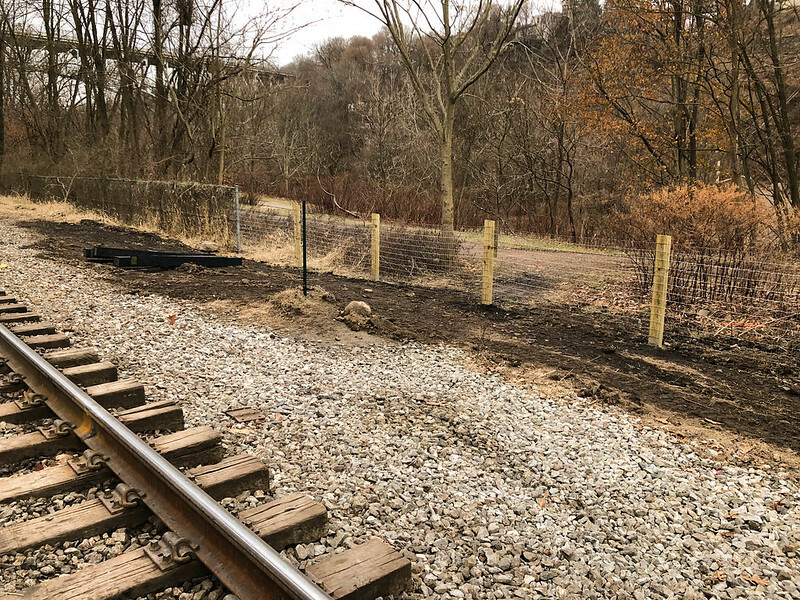 Allegheny Valley Railroad put up a fence in the past few days blocking the Panther Hollow Trail near Panther Hollow Lake where it crosses the railroad tracks. This will be a big annoyance to joggers, dog-walkers, and cyclists that have been entering Schenley Park this way for the past century. There are a few creosote railroad ties close to the new fence, all along the tracks. Are they planning to put in a third track? I have not heard anything about a third track. And crossing the tracks at anything other than an approved signaled crossing is illegal — it’s just that in most places it’s not enforced, because it’s impossible to be everywhere at once. This is a big desire line, and the railroad has employed a number of different strategies to halt pedestrian crossings here. They had an officer parked in a car on one side for a year or two. Fence is maybe cheaper. what’s the over/under that the fence lasts until 2019? Update today from PWSA: PWSA’s consultants will be doing 2 geotechnical borings starting on Monday, December 17, 2018. The first location is the bike trail along Saline Street and the other is along the Eliza Furnace Trail. Each location will take 1 day to complete the work and bicycle and pedestrian access will be maintained while the work is occurring.